Majestic Antonio: Yet £75k-a-week star was the man behind West Ham's win on Saturday - opinion | The Transfer Tavern | Where football transfer rumours fly or die! West Ham supporters have been making a lot of noise in recent times after seeing their team pick up a fourth straight Premier League victory at the weekend. Manuel Pellegrini’s men went into their encounter with basement side Fulham having got past Newcastle United, Cardiff City, and Crystal Palace in their preceding three matches, and thus seeking a fourth successive league win for the first time since 2014. And the Hammers managed to do just that as goals from Robert Snodgrass and Michail Antonio sealed a routine 2-0 success at Craven Cottage, a result which moved the East London outfit up to ninth place in the Premier League table. Consequently, there have been many thrilled West Ham fans up and down the country in recent times, several of whom have been heaping praise on the majestic Antonio, who came into the side as a centre forward given the club’s injury problems, and produced a performance many a natural striker would have been proud of. The former Reading and Nottingham Forest man worked extremely hard leading the line and deservedly got his goal in the first half, combining well up top with fellow forward Javier Hernandez to give Fulham all sorts of problems over the course of the 90 minutes. 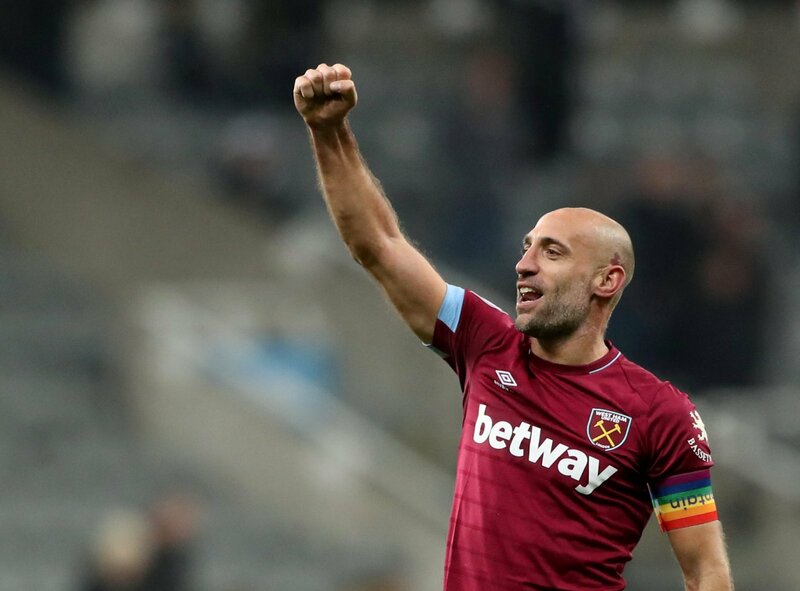 And while Antonio certainly deserves praise for his exploits on Saturday, it was the performance of Pablo Zabaleta which was behind the Hammers’ fourth consecutive victory at the weekend, what with the veteran full back continuing to roll back the years with another impressive display. The 33-year-old, who earns £75,000 a week as per Spotrac, has been a regular in Pellegrini’s team recently in starting 12 of their last 13 Premier League matches, and with performances like the one on Saturday, there is little chance of him losing his place anytime soon. And that’s because the Argentina international was again magnificent in another commanding defensive effort from West Ham on Saturday, winning two of the three aerial duels he contested over the course of the 90 minutes (as per WhoScored), at the time completing all three of the tackles he attempted to thwart the advances of Ranieri’s Cottagers. Add in four clearances and four interceptions, and the 33-year-old repeatedly was in the right place at the right time to relieve the pressure on Pellegrini’s backline, while his one key pass from 31 completed passes suggested that he was at times also an outlet going forward – quite simply, Zabaleta was excellent. Overall, the Hammers have been outstanding in the last few weeks in picking up four wins and moving up the Premier League table, and while Antonio deserves plaudits for his efforts on Saturday, Zabaleta was the man behind the victory to further underline the huge part he has played in their terrific recent run.